It could hardly have been more cordial when a combined team of government and opposition economists from Nigeria arrived in Washington for the Spring Meetings of the International Monetary Fund and World Bank on 17-19 April. In a sign of the country's growing weight among developing economies, the team was quickly wheeled in to meet IMF Managing Director Christine Lagarde and Bank President Jim Yong Kim. Both institutions were eager to talk with the new guard about reform in Africa's biggest economy following the election victory of Muhammadu Buhari and the opposition All Progressives Congress (APC) last month (AC Vol 56 No 8, 'No condition is permanent'). As the euphoria fades after some boisterous election parties, economic realities are hitting home. They include the consequences of a halving of world oil prices over the past year, growing pressure on the naira, and rising fiscal and trade deficits. Rushing from Washington to give a lecture in Massachusetts, Okonjo-Iweala insisted that all sides would win from a well-managed political transition: 'The naira has strengthened and stock prices have gone up… some important uncertainties have gone out of the system.' In discussions at the meetings, though, she conceded that the new government would have to take some tough decisions to cope with falling revenue. Okonjo-Iweala sat on a panel of finance ministers and commodity experts whose consensus view was that the oil price would be around US$65 a barrel at this time next year. That is a more than 40% drop from the levels of a year ago. David Cowan, Citi's Africa economist, forecasts that exports will fall to $55.3 billion this year, down from $82.8 bn. in 2014 (AC Vol 56 No 3, A year of decisions after a decade of growth). Accordingly, Cowan reckons that the trade surplus of $7.4 bn. (1.3% of gross domestic product) will move to a deficit of $12.9 bn. in 2015, even if imports stay at the same level of about $53 bn. At the same time, he forecasts the budget deficit will more than double, to 2.7% of GDP this year, then fall slightly to 2.3% of GDP. Figures from Okonjo-Iweala and her officials are more optimistic but she argues that the new government could boost revenue quickly by increasing value added tax by 5%. Buhari's advisors are more cautious, speaking of improvements to tax collection and tougher action against widespread tax evasion by companies and wealthy individuals. They also talk of staunching revenue leakage and of cutting recurrent spending by merging some ministries and closing some agencies and departments. There is to be a smaller cabinet and fewer ministers of state, and cuts in pension obligations to former state governors. A crackdown on corruption by high office holders – all ministers will be required to declare their assets publicly – could further cut leakage if backed by the more independent and energetic judiciary that the APC has pledged to establish. Although, with 54% of the vote in the presidential election, Buhari's government has a mandate to push through its planned reform of the economic policy-making ministries and of the oil and gas industry, the APC's advisors are striking a very cautious note in the run-up to the handover on 29 May. That is partly due to the challenge of managing expectations as the new government prepares to unveil its economic programme, says Ousmane Doré, the African Development Bank (AfDB) Director in Nigeria. Several APC grandees have been musing in public about 'politics as the art of the possible'. There is an immediate issue about the exchange rate. Ecobank's Angus Downie suggests the CBN might move from a 'managed float' system to a more freely floating currency, if it assesses that short-term pain, such as increased costs in import-dependent sectors, would be outweighed by longer term gains, such as the greater competitivity of non-oil exports. Buhari's victory had given a short-term fillip to the economy but his government will have to deal with a host of pressures pushing down growth and jobs and ramping up inflation and the budget deficit. Both Citi and Standard Chartered Bank calculate that GDP growth will fall to 4.5% this year; both forecast a bounce-back in 2016, to 6.2% (Citi) and 5.5% (Standard Chartered). In late March, Standard & Poor's rating agency downgraded Nigeria's sovereign debt rating to BB-, while Fitch placed Nigeria on 'negative' outlook, indicating a future downgrade. Although it commends the handling of the elections, Fitch sees the change in government as causing uncertainty on economic policy. Partly due to the downturn in world commodity prices, both the IMF and World Bank have cut their forecasts of GDP growth in Africa, to 4.5% and 4% respectively. 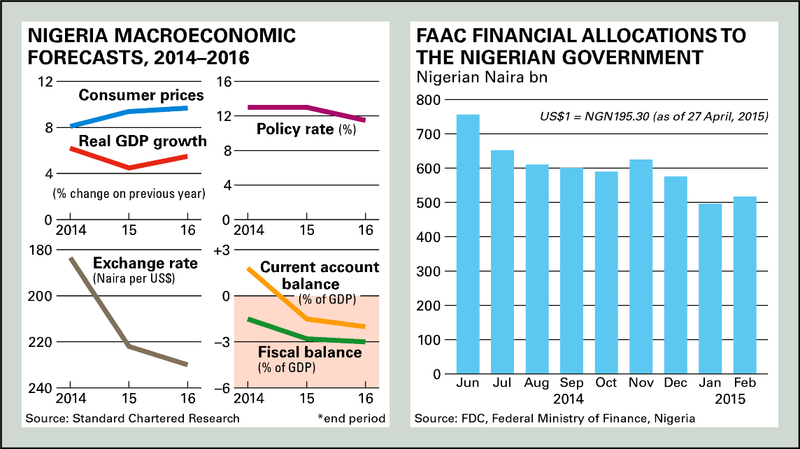 The IMF has cut its estimates for Nigerian GDP growth in 2015 to 4.5%, from its early forecast of over 7%. For once, the Spring Meetings were upbeat about Nigeria's politics and cautious about its economy, which is seeing the most serious downtown for over a decade. Lagarde said Nigeria had 'suffered' from tumbling oil prices and the Africa Department Director, Antoinette Sayeh, described Nigeria as 'very challenged' by its under-performing power sector. Okonjo-Iweala called for increased African representation at the IMF. Weeks earlier, she launched negotiations with the World Bank and AfDB for $2 bn. of loans to bolster this year's depleted budget. Based on a House and Senate-approved benchmark oil price of $53 a barrel rather than the $77.5 benchmark of 2014, the 2015 budget was passed by the Senate on 28 April. President Goodluck Jonathan will sign the bill before he hands over to Buhari on 29 May. The naira 4.49 trillion ($23 bn.) budget allocates N2.6 trn. for recurrent spending, N556.9 bn. for capital projects and N953.6 bn. for debt service. There is no provision for fuel subsidies, which presages more trouble over fuel shortages and sets the new government on a collision course with the oil product importers. When the National Assembly reconvenes in mid-June with an APC majority in both houses, there may be discussions about a possible supplementary budget that will give clear signs of the government's policy. Changing political alignments could boost growth, too. Since 1999, Lagos State has been run by parties which oppose the PDP at the centre and has been penalised financially. Now, with the APC controlling the Federal purse strings, Lagosians hope their state will benefit from more government largesse. Next month, the APC's Akinwunmi Ambode will take over as Governor from Babatunde Fashola, who has an impressive record of managing state services, sprucing up the city, planting trees and unblocking some of the worst traffic jams. Africa economists, such as Standard Chartered's Razia Khan and Ecobank's Downie, told us that Lagos State, whose economy is far larger than Ghana's or Kenya's, should attract more infrastructure financing from the Federal government and counterpart finance from the markets. Part of that will be reward for the national role of Lagos, and that of its political chieftain and former state Governor, Asiwaju Bola Ahmed Tinubu, in underpinning the south-north alliance that was the backbone of the APC's national campaign. At a time of fiscal stringency, President Buhari may not want or be able to favour the State too much – the Lagos-Ibadan corridor is already the country's richest area – given the desperate financial needs of much of northern Nigeria, the biggest vote bank for the APC. Further east, in the Niger Delta, where the PDP still dominates all the state governments, Buhari will face both political and economic challenges (AC Vol 56 No 8, Mending fences). Having promised to work for all Nigerians, including those who voted against him or didn't vote at all, he will have to work hard to win the support of this oil-producing region, which still earns the country 95% of its foreign receipts. After the exit of the APC's Rotimi Amaechi as Rivers State Governor, the new government faces fresh agitation and mixed messages from militants in the Delta. Some former militants, enriched by generous security contracts with the outgoing government, have offered a conditional welcome to his successor. Others regard Buhari as an illegitimate usurper of Jonathan, his predecessor and the Delta's first President, and have threatened mayhem if any of the special deals offered to the region – such as the costly amnesty programme for former fighters – are unpicked. With revenue already squashed by the world price crash, the new government wants to re-establish calm and stability in the country's oil and gas industry. That means tackling the highly organised oil theft cartels, which carry away over 100,000 barrels per day (bpd) with the connivance of some senior military officers and business people. Finding a way to do that without sparking another round of conflict in the region will take pragmatism and some strong local political allies. At the same time, the government has to win the confidence of the international oil companies and the fast-growing local ones. Investment in the local oil industry has been falling in relative terms for the past decade, partly because of international trends such as fracking and oil substitution, and partly because of uncertainty about planned new taxes and royalties. Nationalists in the APC applaud the building up of local companies which, with government encouragement, have been buying up onshore oil assets from their big foreign counterparts. However, they criticise some of the sales for opacity and crony capitalism. Although some sales have been shrouded in allegations of corruption and political favouritism, APC advisors give little indication of policy towards such transfers other than to insist all future deals will have to meet far higher standards of probity and accountability. Many of the leases on the transferred blocks, such as OML 29 and 245, come up for renewal over the next couple of years, at which point the government will be able to review the operating and fiscal terms, one industry expert pointed out. More widely, the new government wants to resolve the impasse over the Petroleum Industry Bill, stuck in the National Assembly after multiple revisions for over five years. APC insiders talk of unbundling the state-owned Nigerian National Petroleum Corporation (NNPC) and proceeding with reform episodically. Restructuring the oily behemoth will be the first priority, they say. That is likely to mean clear lines of responsibility and management or even corporate bodies for production, refining, pipelines and distribution. This will be followed by the reform of fiscal terms, taxes and royalties. Maximum efficiency and accountability are the watchwords, we have been told. This will start with the release of the PriceWaterhouseCoopers audit of NNPC revenue management and an early announcement, perhaps on 29 May, about a system of public disclosure of accounts and transactions. NNPC management is already bracing itself for a purge and reshuffle, as well as some structural changes. The APC manifesto proposes that the Petroleum Minister should no longer sit on its board of directors. More radical reforms, such as selling the NNPC's stakes in oil block joint ventures, are also being mooted: the attraction is that such sales could raise much-needed revenue for the government and reduce its obligations to provide finance for the joint ventures with the multinational oil companies. Yet Buhari, who set up the NNPC when he was Oil Minister in the late 1970s, is not seen as an enthusiast for such privatisation. Nor are his allies, who say that private ownership, whether Nigerian or foreign, will not necessarily stop skullduggery. All seem agreed that a strongly independent regulator and ombudsman are essential to reform. Most recently it was the Central Bank of Nigeria Governor, Godwin Emefiele, who floated the idea, in an interview with the London daily Financial Times, of the NNPC selling equity stakes (AC Vol 55 No 4, Oil theft row escalates). He suggested that it could raise as much as $70 bn. from selling 30% of its assets. That the idea was voiced by Emefiele will make it no more acceptable to the APC, many of whose leaders have been sharply critical of his performance as Governor since he took over the CBN from the widely praised Sanusi Lamido Sanusi last year. In particular, questions are being asked about the highly restrictive regulations on foreign exchange transactions that Emefiele introduced and the narrow band of beneficiaries of those new rules. Equally, there is widespread concern about the run down in foreign reserves, now at less than $30 bn. or four months of imports. Some of it has been spent on trying to prop up the naira. Agriculture would benefit from naira devaluation once the wider economy adjusts, says Citi's Cowan. In any event, another devaluation is likely later in the year should the parallel market value of the currency fall significantly again. Few in Abuja want to second guess the naira-dollar exchange rate but many bankers argue that it is not worth spending more foreign reserves on defending it at its current level of $1=N200. They add that a positive early performance by the new government – the speedy announcement of a technocratic cabinet and clear policies on boosting accountability – could lift the currency more than pumping in more reserves. The legendarily unreliable power industry holds back growth and investment. Although Jonathan's government completed the break up and sale of the old state-owned power company, the private companies which bought these assets have their own financial and technical struggles and complain about the lack of a reliable gas supply to run the generators. The APC aims to triple the country's 4,000 megawatt power generation within its first four-year term. In relative terms, that ambition ranks with what economic stars such as China and South Korea have achieved. Buhari's first step in that direction is likely to be the privatisation of the Transmission Company of Nigeria. Some of the biggest problems in the system are caused by badly maintained inter-connectors and transmission networks. It's less clear what the new government will do with those privatised electricity companies still in financial trouble. Last year, the CBN and local banks arranged for a power sector fund of over N200 bn. to bail out some of the shakier companies. The Chairman of the Nigerian Electricity Regulatory Commission, Sam Amadi, says the incoming government could easily change course. The government may review power company compliance with commitments under the privatisation agreements. It may also try to crack down on gas flaring: Nigeria declined to join this month's endorsement by industry and governments, including Angola, Cameroon, Congo-Brazzaville and Gabon, of the World Bank's 'Zero Routine Flaring by 2030' initiative. Attracting investors into the gas industry and ending flaring will require rapid agreement on gas tariffs and operating conditions, which in turn will determine electricity prices. Private investors are also being sought for the fuel sector. Recent disputes between the federal government and local fuel marketers over payments and subsidies have worsened shortages. Regardless of whether Buhari presides over the privatisation of the four rickety state refineries, three of which he had built when he was Oil Minister in the 1970s, he is said to back investors such as Aliko Dangote and his refinery project near Lekki, just outside Lagos (AC Vol 54 No 18, Cracks widen in the PDP). This week, Dangote opened discussions with United States-based Blackstone for finance on the 650,000 bpd refinery project, which is targeted initially at the regional as well as the domestic market. Investors are showing growing interest in Nigeria since the elections, according to Peter Enti of Nubuke Investments. In turn, he believes, that will mean progress for neighbouring countries, where Nigerian banks and companies are expanding. As China slows down and the US dollar strengthens, will African governments try to diversify and industrialise their economies? Prepared for Free Article on 24/04/2019 at 03:42. Authorized users may download, save, and print articles for their own use, but may not further disseminate these articles in their electronic form without express written permission from Africa Confidential / Asempa Limited. Contact subscriptions@africa-confidential.com.